An easy recipe for grilled Fajita Veggies, just like they make at the Chipotle restaurant. Colorful, tender-crisp, and healthy, these grilled veggies are ready in minutes. And you can add in your other favorite vegetables, too! 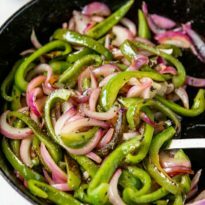 In a large skillet, heat the oil over medium-high heat until shimmering. Add the peppers, onions, oregano, and salt. Heat until slightly softened but still tender-crisp, about 7 minutes. Remove from heat and serve.